The town on man-made Rokko Island, built on land reclaimed from the sea, holds a welcome event for new residents every spring. 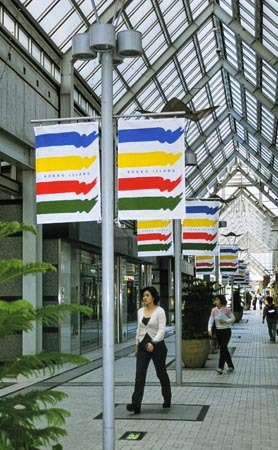 Banners are used to produce color and bustle in the town. The new city without a history has the possibility of any expression, just the same as a white canvas. And then I thought of a design. The city's central plaza does not allow motor vehicles.The city looks like a miniature garden from nearby places, it has bridges, spiral steps, and walking paths with streams of water on both sides like a corridor. So, we can think of this town as a gallery, the Gallery of the Wind.